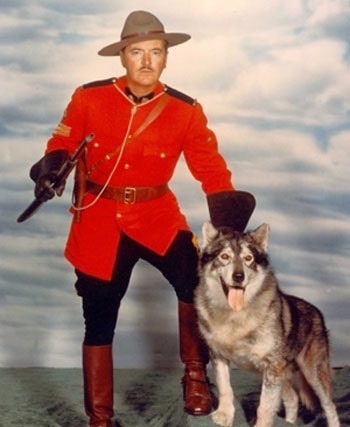 Did you know that one of the first radio and television action heroes was a Husky? His name as Yukon King and his mythical adventures thrilled audiences from 1938 to 1958. The series took place in the 1890s at the height of the gold rush in the Klondike. Scripts mentioned actual towns in the area which are still in existence today. The radio show was originally entitled, “Challenge of the Yukon” and debuted locally in 1938 on WXYZ, a fabled radio station in Detroit, Michigan. Each episode ran 15 minutes. The theme song used for the series was Von Reznicek's Donna Diana Overture. The series moved to network radio, and a nationwide audience, in 1947 where each episodes then ran for 30 minutes. The series changed its' named to “Sgt. Preston of the Yukon” in 1951. The owner of station WXYZ, George W. Trendle, wanted an action series about a dog. He knew this meant that the dog had to be a rugged, working dog. The choice of a Husky seemed like a natural. The backstory of King was that he was a Husky pup, raised by a mamma wolf. Shortly after the mother wolf is killed by a lynx, Sgt. Preston happens along the scene and finds the now orphaned King. He rescues him and raises him to be his friend and crime fighting partner. Given ARA's mission, it's fitting that King is a rescue dog. Dogs are smart, but training one to bark on queue for a live radio program wasn't practical. The sounds of King, including his ferocious bark, were first made by sound effects artist Dewey Cole. After Mr. Cole passed away, the role of King fell to Ted Johnstone. The role of Sgt Preston was first played by Jay Michael. Paul Sutton eventually took over the role and is the actor probably most associated with Sgt. Preston. For a time, the role of Sgt. Preston was played by Brace Beemer, the actor best known for playing the Lone Ranger on radio. Because “The Lone Ranger” and “The Green Hornet” also came from WXYZ, the writers, actors and directors at the station worked on all three shows. Like “The Lone Ranger,” the stories on “Challenge of the Yukon,” were all family friendly. King and Sgt. Preston foiled bad guys, saved lost children and battled greedy miners in the Yukon. Most stories had a happy ending. At the end of most episodes, Sgt. Preston would say, “Well King, this case is closed,” usually thanks to the heroics of King. On television, the role of Sgt. Preston was played by Richard Simmons. His co-stars were Preston's horse Rex and, of course, his faithful dog King. In the television series, King was played by a malamute, also named King. The television series had the rare distinction for those early years of being filmed in color. The town of Ashcroft, Colorado doubled as the Klondike of the 1890s. The budget for the series was rather slim and many of the same sets were used over and over again. You can listen to their original radio show for free online here. You can also buy the DVDs of their TV series. If you use our Smile.amazon.com link here, will get a portion of the sale, at no extra cost to you. Make sure you select supporting ARA Canine Rescue.